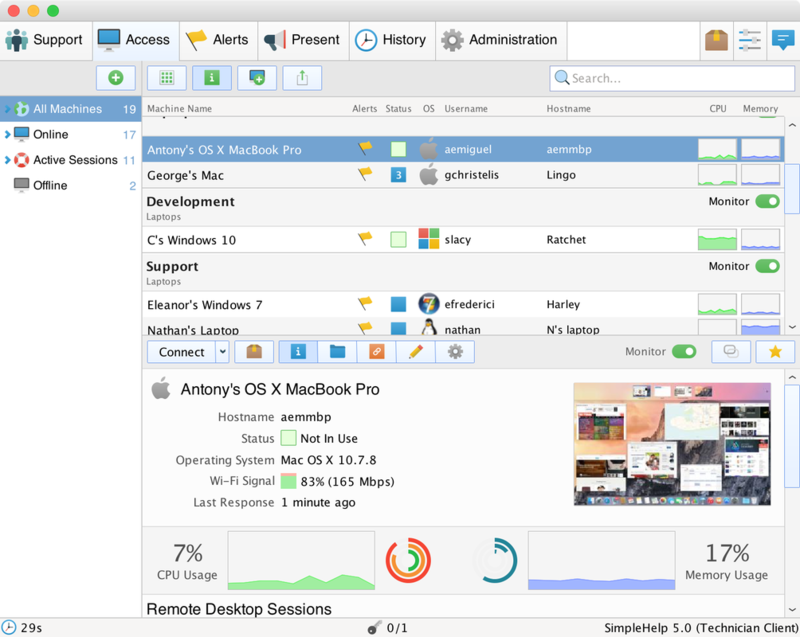 In order for a computer to be made available at all times its necessary for SimpleHelp to have a service running on that computer. To set this up just point a browser at the /access page on your SimpleHelp server to download the Remote Access installer, then run it. This will open up a configuration app where you can set a name for the shared computer, set permissions to disable monitoring or require a machine-specific password, and configure an HTTP proxy if necessary. You can also add groups and sub-groups to categorise it in the list of computers in the Technician client. Computer Name - this is the name that will appear in the Access tab for this service. You can specify a group using a / delimited name, such as GroupA/Machine. Use AUTODETECT to have the service pick a name automatically. Remote Access Servers - each remote access service can register with one or more SimpleHelp servers. If you enter in multiple server addresses then the remote access service will appear on both servers simultaneously. Server addresses can register over HTTP, UDP or HTTPS. If possible, we suggest using UDP for registrations since it is more efficient and scalable than HTTP. If UDP is not available then we suggest using HTTP. We do not recommend having both UDP and HTTP register with the same SimpleHelp server. Initial Group - create a group, or choose an existing one in which this service will appear. Start / Stop - start or stop the remote access service. Allow monitoring - choose if technicians should be able to collect monitoring information from this machine even if a session is not active. Allow scripts - choose if a technician should be allowed to run commands on the machine even if a session is not active. Require confirmation - choose if every session to this machine must be acknowledged by the current user. Password - enter a password if you wish to restrict sessions to this computer, or if you wish to restrict a technician's ability to reconfigure the service. Once set up your computer will appear in the Access tab in the technician client. From here you can see a wealth of information including charts and expandable screen thumbnails all updated live. 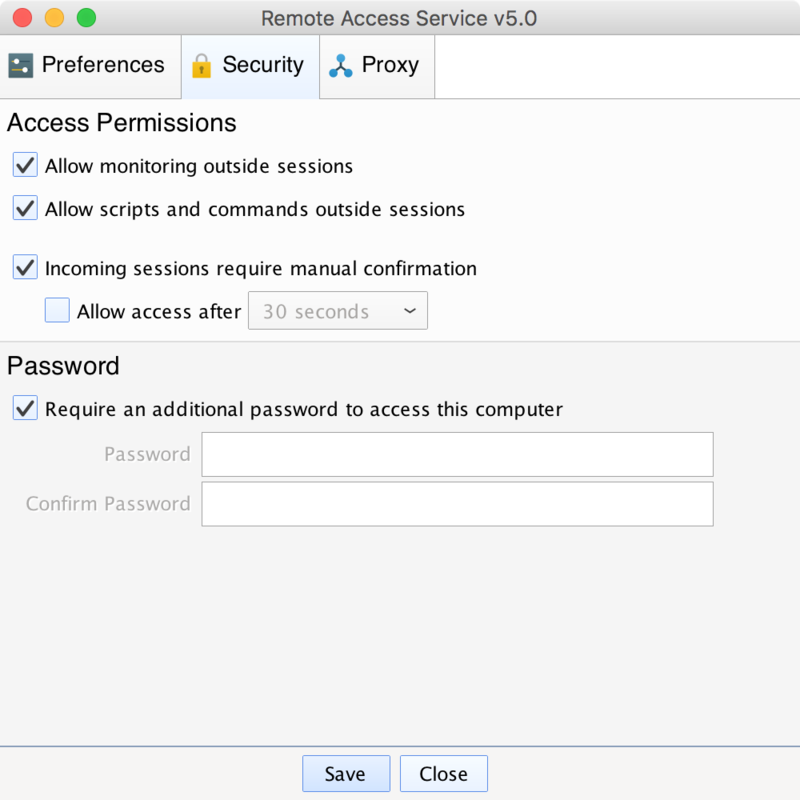 The default behaviour when the Remote Access Service is downloaded is for the Remote Access Configuration application to launch. 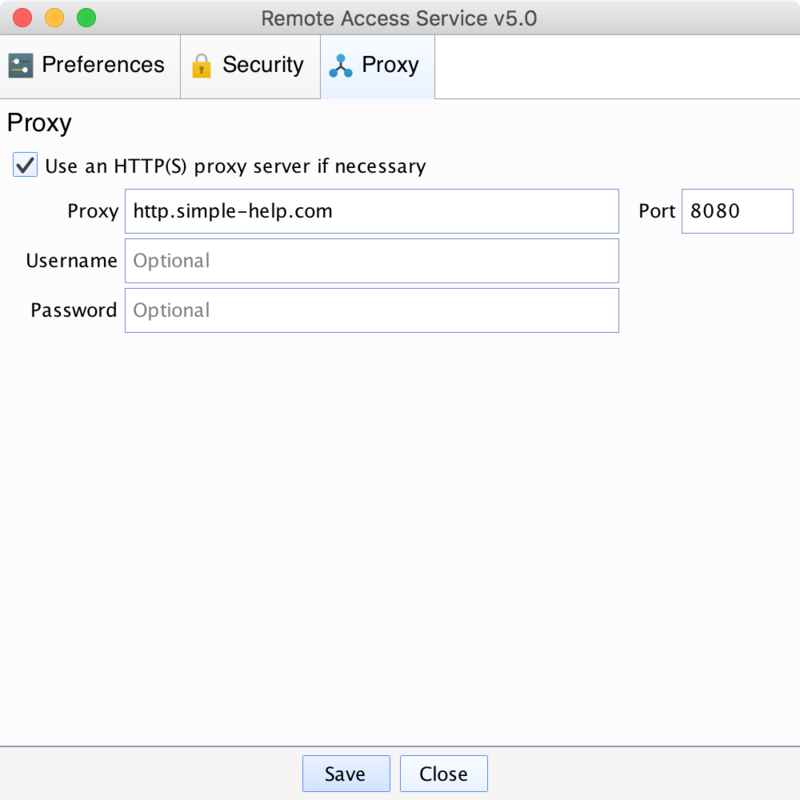 This application allows you to start the Remote Access Service. Simply executing the Remote Access executable will not automatically start the service. The service is to be installed on a headless server that has no monitor plugged in. Here there is no way for the Configuration application to appear to the user. The service is to be deployed to many machines where manually interacting with each installation is undesirable. 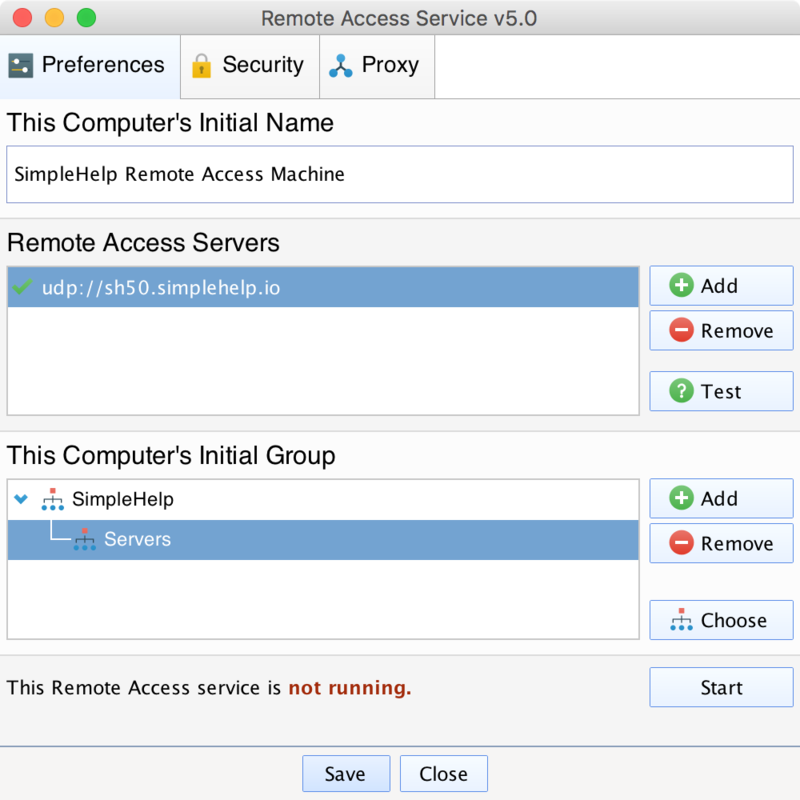 You can use the standard Remote Access installer (downloaded from /access on your server) and pass in a set of parameters to automatically configure and launch the server. 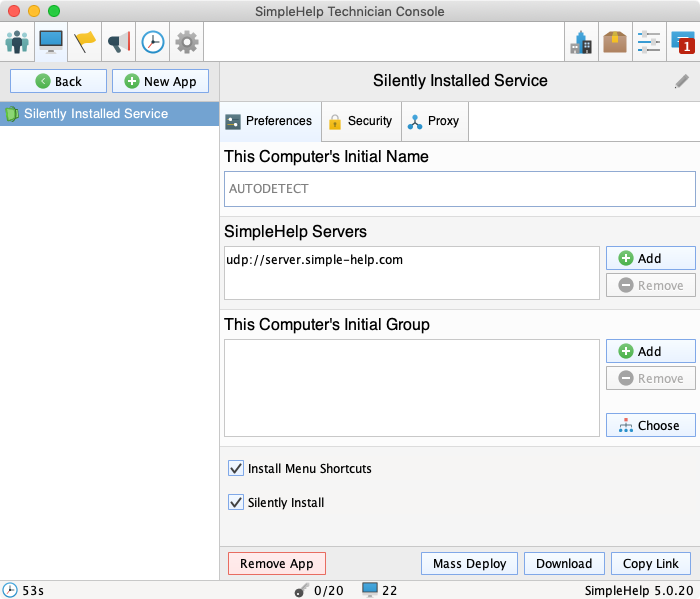 You can download a preconfigured binary from the SimpleHelp server that includes your configuration details and instructions to silently install. /S requests a silent installation. /NAME requests that the service name be automatically detected. /HOST specifies the server address to register with. Additional documentation on silent installation parameters are included in our Pre-configuration Article. Preconfigured binaries are downloads of the service from the SimpleHelp server that contain settings and instructions to install silently built in. There is no need to pass in command line parameters with these binaries. You will be presented with a configuration UI that is very similar to the Remote Access Service configuration. Here you can configure multiple different services, each with different configuration settings. Once configuration is complete use Mass Deploy to deploy the service across multiple machines, Download to download a preconfigured binary, or Copy Link to copy the link to the download into the clipboard.